Home › Articles › Municipal refuse removal is expensive, may I do it self? Municipal refuse removal is expensive, may I do it self? Is it feasible to sidestep the refuse removal levy on your monthly municipal account? The short answer is “no”, although there is the welcome prospect of future cost relief within a specific framework. Obligatory national municipal recycling will be implemented in phases in the foreseeable future; Johannesburg launched this initiative in June 2018. Lessons learnt from this will undoubtedly contribute to the streamlining of the planned national initiative that will follow in due course. One would surmise that focused recyclers and refuse managers (with the purpose of a minimal dumping restante of their refuse) might no longer need or want the municipal refuse removal service. One could then efficiently and (at no cost) go and dump the minimum amount of refuse that might remain after effective reclaiming at the designated sites? Unfortunately, residents will not be able to avoid the municipal levy, but they will definitely have to pay less in the long term. Official enquiries confirm that this municipal service in urban areas is (and will remain) subject to an obligatory levy, regardless of whether or not you have a small box of refuse remaining after reclaiming. Not taking into consideration the politically correct answers hereto, the apparent motivation for this is the city and town councils’ reliance on a specific budget generated from these levies. Without these, a large segment of their guaranteed income would be jeopardised. 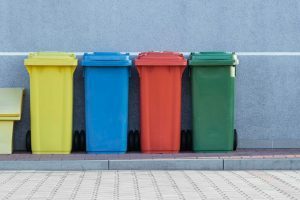 The long-term saving on which consumers can rather pin their hopes (as opposed to the municipal refuse removal levy), is that the planned obligatory cost-saving municipal recycling has to be implemented sooner rather than later. This will undoubtedly exponentially diminish the eventual cost of refuse removal or at least prevent an exorbitant increase in the levy in the next five to six years. The Tshwane Municipality web page does mention that small holdings falling outside municipal refuse removal routes that do not receive this service, may remove their own refuse and dump it free of charge at the designated dumping site, to a maximum of 1,000 kg per month. The reference on the same page to permits for private recycling contractors and removers, does not apply to municipal residents. It is aimed at the group of entrepreneurs who started individual recycle operations, prior to the recycling initiative began taking in an institutionalised format (as recently in Johannesburg). The guidelines regarding permits et cetera (on the web page) will definitely be adjusted as the establishment of the new approach of obligatory reclaiming begins to extend systematically to other municipalities. The contractors referred to currently still find them in the grey area “between an old and a new system” and are ostensibly allowed to continue. A cut-off time in this regard will come into force. However, there is no possibility that municipal residents will be able to sidestep refuse removal levies. Rather focus on the fact that eventually, at a snail’s pace, as soon as the obligatory municipal recycling gets going, you will have to proportionally pay a lot less for your refuse management. So, welcome the obligatory recycling guidelines as soon as they are instituted in your municipal suburb. Viewed overall, in the long term it will decrease your municipal refuse removal levy.